Most medications, agricultural chemicals and functional materials, indispensable for maintaining and improving our lives, are composed of organic molecules. Organic synthesis using a catalyst is the method for the rapid and large scale supply of such organic molecules without imposing a heavy burden on the environment. In this research field, Prof. Noyori in 2001 and Profs. Suzuki and Negishi in 2010 were awarded the Nobel Prize in Chemistry; Prof. Noyori, for "chirally catalyzed hydrogenation reactions," and Profs. Suzuki and Negishi, for "palladium-catalyzed cross-couplings." In recent years, catalysts consisting of only organic molecules but without metal elements, i.e. organocatalysts, have been regarded to be next-generation catalysts, and have received much attention. However, some organic chemistry reactions cannot take place with a single catalyst. Many investigations have therefore been carried out on using two or more catalysts in a synergistic manner for organic synthesis, creating a new category in this research field. In the human body, for example, several catalysts (enzymes) work in a synergistic manner for synthesizing complex organic molecules that exert important functions. Likewise, organic synthesis could potentially be carried out by two or more catalysts in one flask. Nonetheless, it has been thought to be a difficult task to realize such catalytic systems because catalysts themselves react with each other in many cases to abolish their catalytic ability. 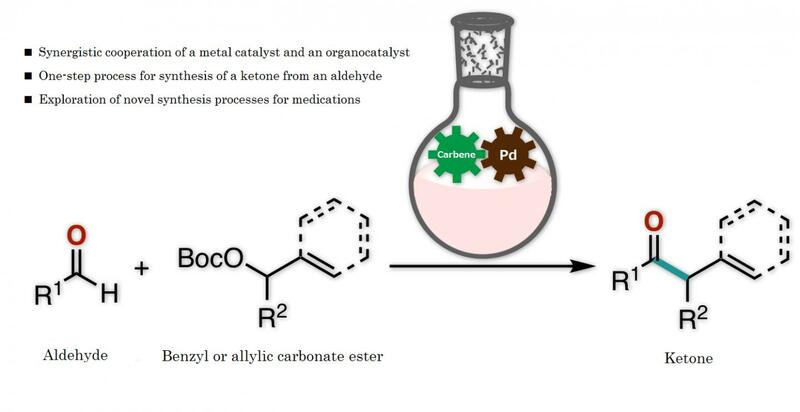 The research team of Kanazawa University successfully synthesized a ketone from an aldehyde and a benzyl, or from an aldehyde and an allylic carbonate, by the synergistic action of an organocatalyst and a palladium catalyst in one flask (Figure 1). Thorough examination of the reaction conditions revealed the importance of thiazolium N-heterocyclic carbene as the organocatalyst and palladium with augmented activity by bisphosphine, an organic phosphorus compound, as the metal catalyst (Figure 2). It should be mentioned that no catalytic reactions were found to take place in the absence of either of the two catalysts, indicating that two catalysts are indispensable for such a reaction to take place. Synthetic conversion of an aldehyde into a ketone by conventional methods required a complicated process with multiple chemical reaction steps or a metal reagent that would impose a substantial burden on the environment. The newly developed protocol, on the other hand, enables the synthesis of a ketone of complex chemical structure from an aldehyde under simple and mild conditions (Figure 3). The key to success is that the aldehyde, which is known to act as an electrophile in chemical reactions, in fact worked here as a nucleophile. Thus, the novel protocol enables the rapid and simple synthetic conversion of an aldehyde into a ketone, which is an important basic structure found in a variety of medications and medication candidate chemicals. It was thought to be difficult for a transition metal catalyst and an organocatalyst to function in a synergistic manner in one flask with their individual functional activities maintained. The present study represents a milestone in this field. Furthermore, a novel design guideline has now been established in the field of "organic synthesis using catalysts." It is expected that, by changing the combination of catalysts to be employed, a variety of synthetic reactions that have so far been difficult could be developed, which should pave the way for new technologies for synthesizing medications and medication candidates in a simple and easy manner but without waste.